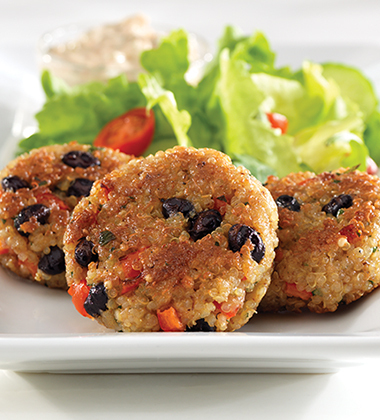 These delicious quinoa patties are made with Campbell's® Signature Low Sodium Vegetarian Vegetable Culinary Foundation and combined with bread crumbs, black beans, bell pepper, eggs, cumin and fresh cilantro. Sautéed until golden brown and served with a mouth-watering sauce, your patrons will absolutely love the incredible flavor! 1. Grate 1 teaspoon zest and squeeze 1 tablespoon juice from the lime. 2. Heat 1/4 of the oil in a 3-quart saucepan over medium-high heat. Add the quinoa and stir for 1 minute or until lightly browned. Combine Campbell's® Signature Low Sodium Vegetarian Vegetable Culinary Foundation and the water and heat to a boil. Reduce the heat to medium-low. Cover and cook for 20 minutes or until the liquid has been absorbed. Remove the quinoa from the heat and let cool for 15 minutes. cumin, ground	 0 3/4 tsp. egg, large	 4 oz. 2 ea. cilantro	 1 oz. 2 tbsp. kosher salt	 0 3/4 tsp. 3. Thoroughly mix the cooked quinoa, bread crumbs, cumin, beans, yellow pepper, eggs, 1 Tbsp. cilantro and salt in a large bowl. Firmly shape the quinoa mixture into 28 patties (3/4-inch thick), using about 1/2 cup (#8 scoop) quinoa mixture each. 4. Heat about 1/3 of the oil in a skillet over medium-high heat. Add the patties in 3 batches and cook for 8 minutes or until well browned on both sides, turning the patties over once halfway through the cooking time and adding the remaining oil to the skillet as needed. Remove the patties from the skillet. CCP- Hold hot at 140°F or higher for service. ground chipotle chile powder	 0 1/2 tsp. 5. Stir the yogurt, chile powder, lime zest, lime juice and remaining cilantro in a medium bowl to make a sauce. 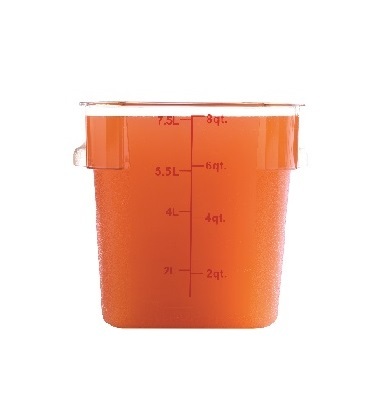 CCP: Hold under refrigeration at 41°F or lower until served. egg	 3.5 oz. 2 ea. cilantro	 0.5 oz. 2 tbsp.